As the 13-1 volleyball team’s season moves full speed ahead, the six returning seniors have stepped up and filled leadership roles. “I feel so fortunate to be around an older group of girls who are great leaders and supporters,” freshman varsity player Kamryn Stark said. Since most of these seniors have had three years of experience playing high school volleyball, they bring back many necessary skills to fill those leadership roles. They have the playing experience needed to not only be a good example to underclassmen, but to help out with advice. Head volleyball coach Summer Younie says that the seniors show leadership by the work ethic they demonstrate. She says that all six of the senior girls work tremendously hard. They are positive and have high expectations for the underclassmen. This helps to hold younger players accountable. 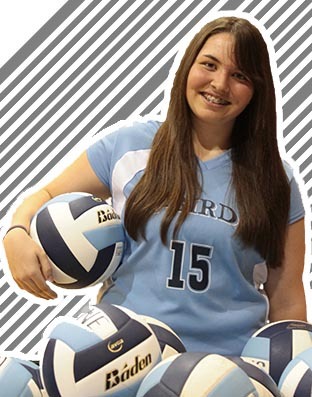 “As a senior, I try to help any underclassmen who look confused or ask for it,” senior varsity player Taylor Tobin said. After playing all four years of high school, Tobin said that she remembers how confusing it can be at first and how beneficial it can be to have a senior around, able to help out when needed. Younie says that Taylor DeWeese and Tobin really stand out in the leadership that they show. They came out during practices and weights during the summer, which was just one example of their work ethic. Q: What’s your favorite part about playing volleyball? A: Being with the team. They’re funny and I enjoy being with them. Q: What’s your favorite part about being a student-athlete? A: Being able to play for my school and represent them. Q: Do you have any personal goals for the volleyball team? Q: Do you have a certain outlook before each game? A: I just want to always try to have fun. Younie said that DeWeese and Tobin constantly work hard and their improvement inspires younger players. She said underclassmen respond well to them because they always have a smile on their face. “A lot of girls are natural athletes, but the Taylors have worked hard, and that makes them relatable,” Younie said. Younie says that Janessa Davis is also an example of someone who plays hard all of the time. Seniors lead the team in how to act on and off the volleyball court. Leadership displayed during practice can also be seen in the hallways at school. “We wouldn’t be where we are without any of the seniors,” Younie said. Younie has high expectations for this season, and the girls aspire to complete another trip back to State volleyball in Emporia. 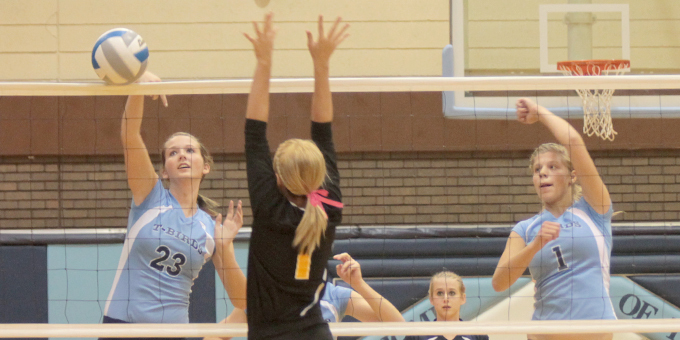 Younie would like to see them win the Kiowa County Tournament and compete well at the Garden Plain Tournament. She also believes that they can be undefeated in League play and hopefully win the league tournament. Right now, Younie says that one thing the team needs to work on is being consistent. “I think that we can do really well and should definitely be able to return to State,” Tobin said. The volleyball team has made it to the state volleyball tournament the past two years. Previously at State, the girls placed fourth in 2011. Although the team made it to State last year, they didn’t place in 2012 because they didn’t qualify for finals. This past August, they were ranked fourth in 2A pre-season rankings. “If the girls play as well as I know they can, they should not only be able to make it to State, but also place at State,” Younie said. She said the team is made up of a really fun group of girls. Be watching the girls as their season progresses. Their next game is a Junior Varsity and Varsity tournament at Kiowa County on Sept. 28, starting at 9 a.m. Come out, support them and cheer them on to victory. Great story. Keep up the good work.